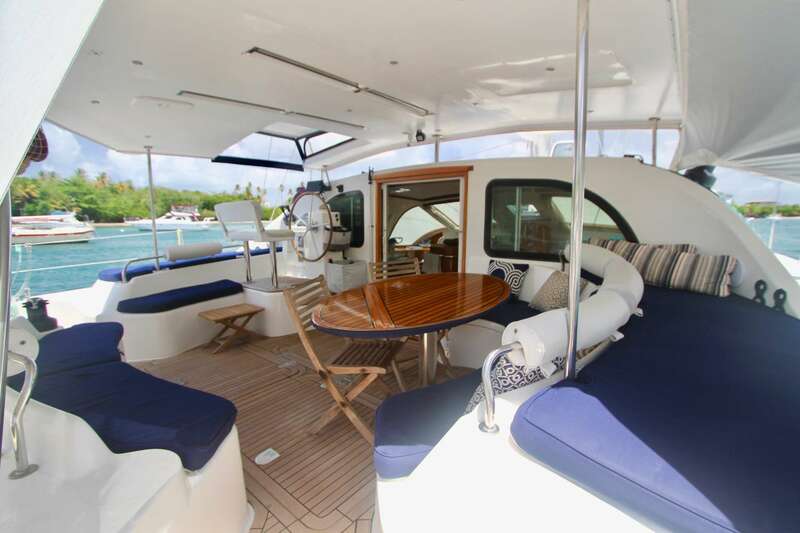 Isola Blue is a 49 ft Privilege 465 Catamaran. 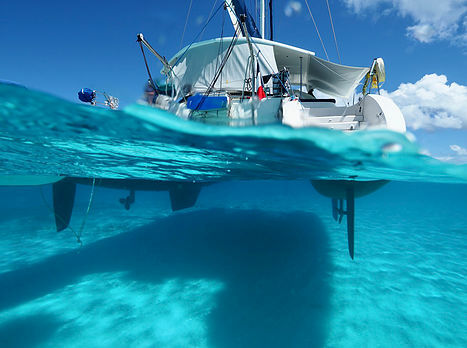 She is an extremely solid yacht, built to ocean going standards. 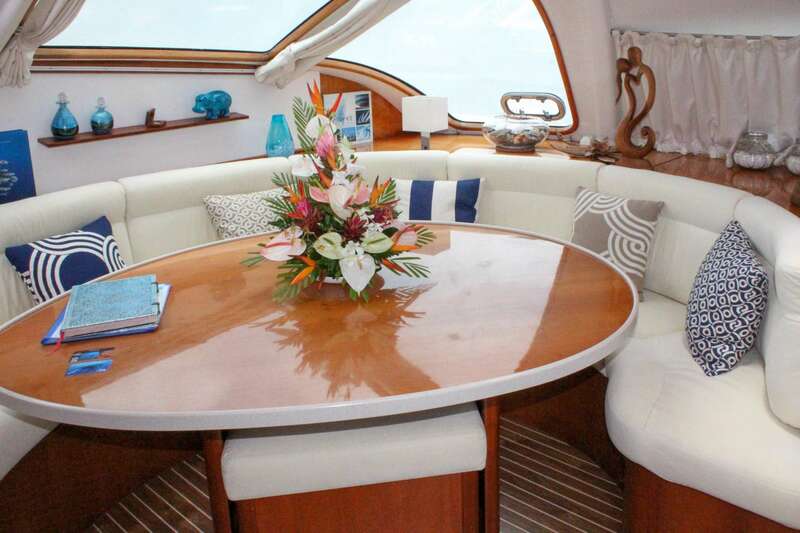 Both her interior and exterior are practical, yet very luxurious and comfortable. 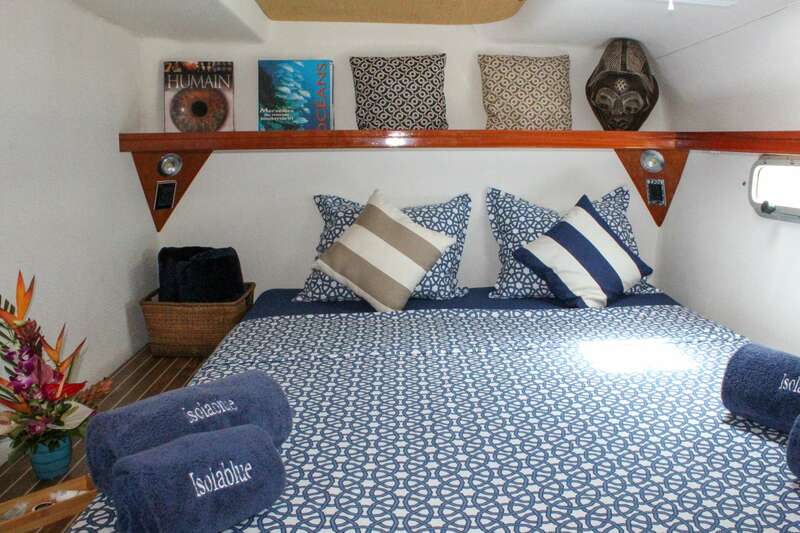 Isola Blue is well maintained and equipped for self sustained independent living at sea. She comes with brand new air conditioner chiller inverter, generator, water maker, electric winches, battery chargers/inverter, solar panels, refrigerator, freezer, dive compressor and more. Please note the crew makes purified drinking water. 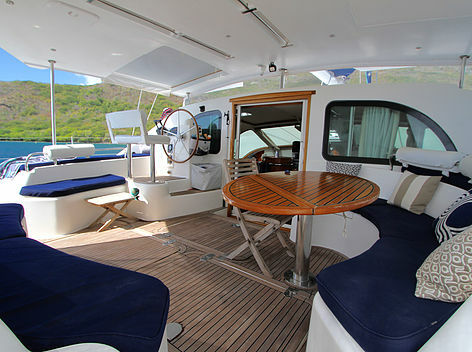 Isola Blue has a large shaded cockpit, perfect for al fresco dining, happy hour or just relaxing. 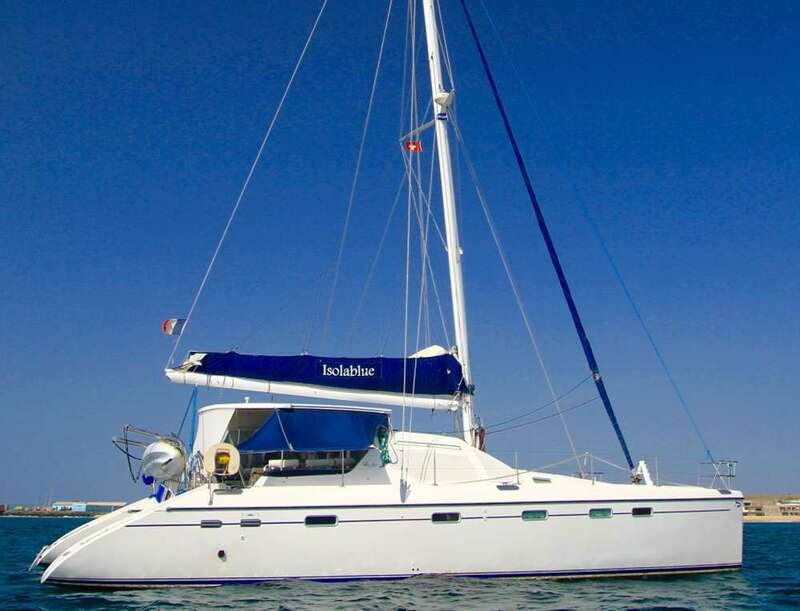 She has vast amounts of deck space and trampolines for sunbathing and stargazing. 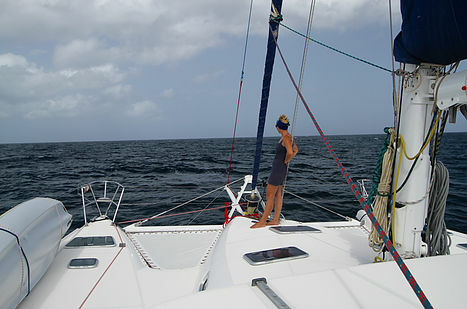 The aft steps offer easy access to the water. 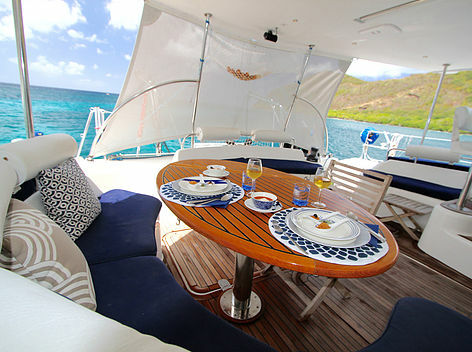 Isola Blue is truly a luxury floating villa in the Grenadines! 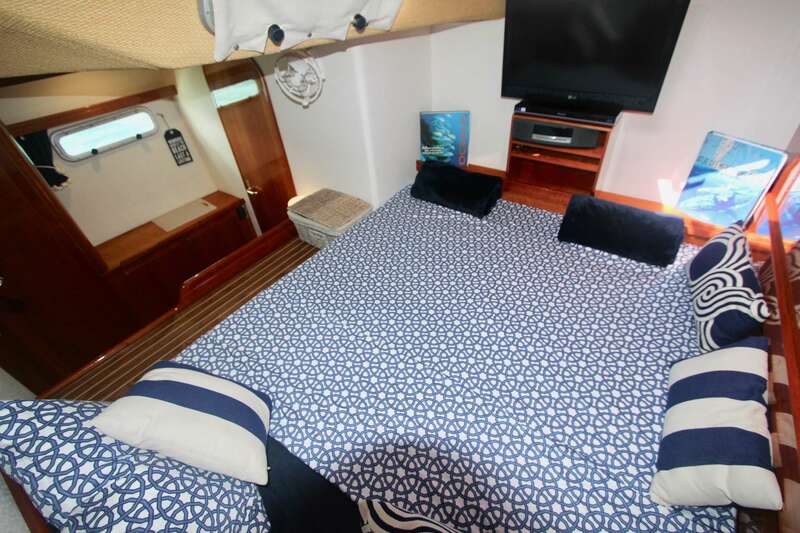 The yacht accommodates 2-4 guests in complete privacy, 6 if you are good friends or a family with children, as in that case 1 of the bathrooms will be shared. 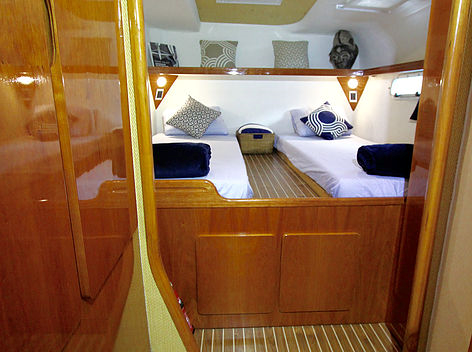 2 guests (1 couple): the starboard forward cabin with queen bed (5ft2inx6ft5in) and ensuite bathroom. 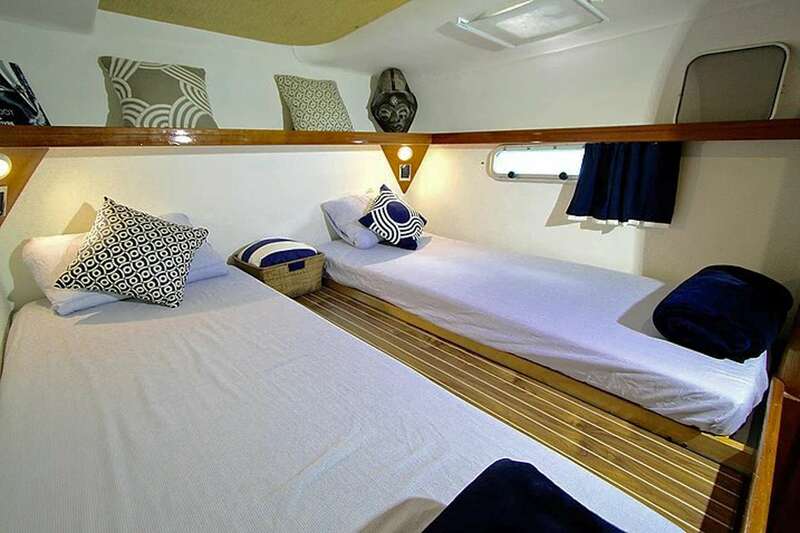 The starboard aft office/twin cabin can be used as a dressing room, so you’ll have this entire hull to yourselves. 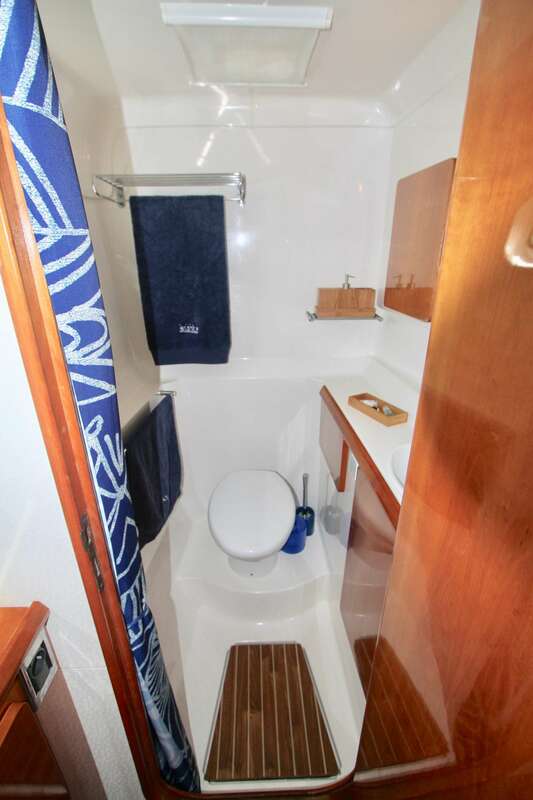 4 guests (2 couples): The port and starboard forward cabins, each with their own ensuite bathroom. 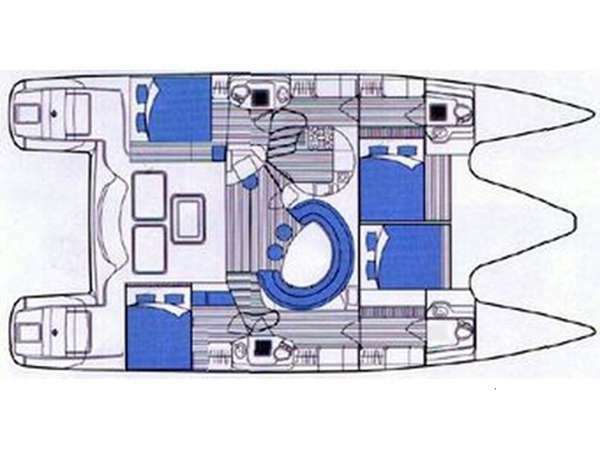 4 guests (1 couple with bigger children): one of the hulls, preferable the port hull because the aft cabin bed can become 2 separate beds. 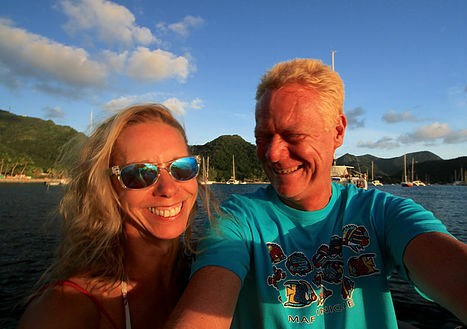 Laurent and Astrid released themselves from the corporate world to live their dream. 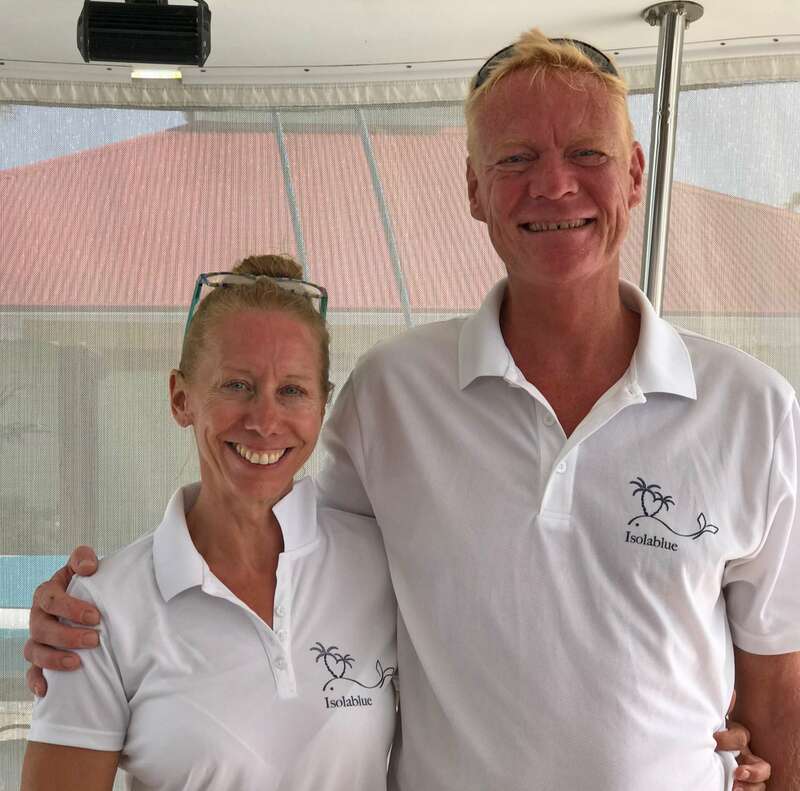 They sailed Isola Blue from Europe to the Caribbean and loved the Grenadines so much they decided to stay! 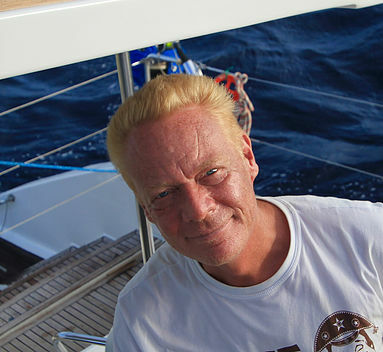 Laurent grew up in Paris, but has been sailing and diving since his childhood. 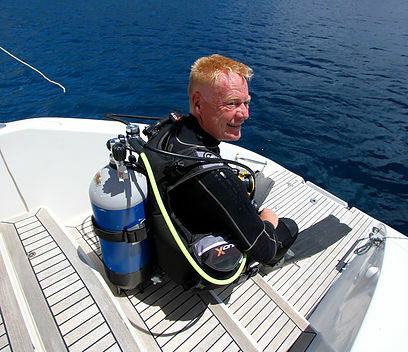 He is a PADI dive instructor. When he gets a chance he likes to play (bass) guitar. He speaks French, English and some German. 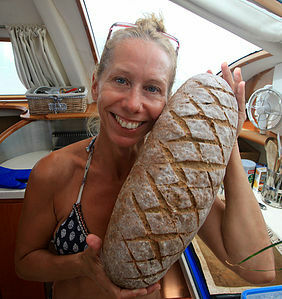 Astrid grew up at a lake in Switzerland where her parents had a restaurant . 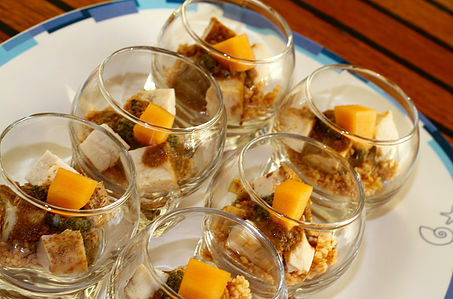 She loves cooking, exercising and meeting people. She is fluent in French, German and English and speaks some Italian and Spanish. 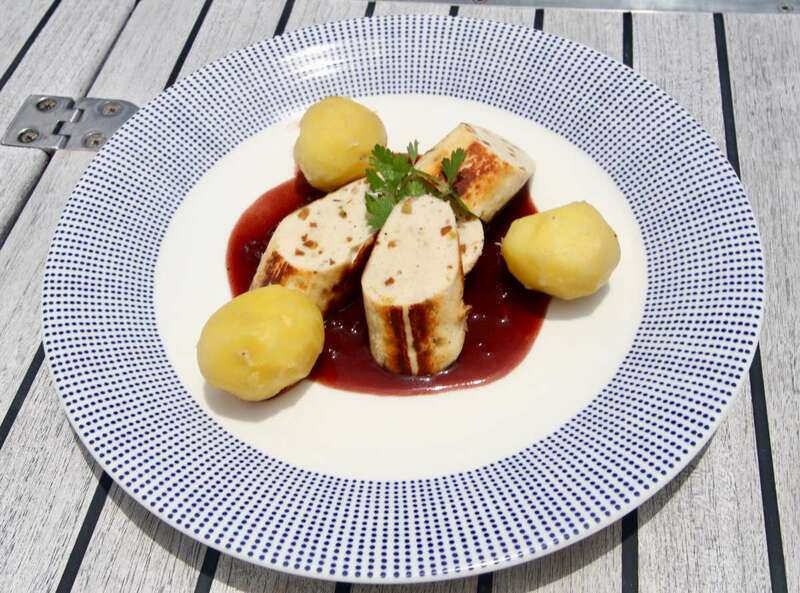 Astrid uses local fresh ingredients and loves to create meals inspired by Meditteranean and Asian cuisine, always with a French touch. 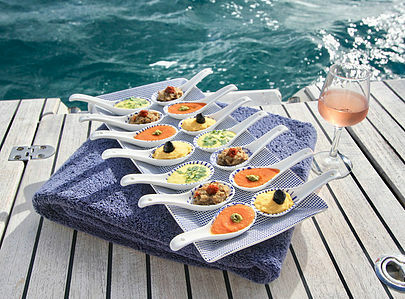 At the 2018 boatshow in Grenada she won 1st price with her 3 color appetizers dish. 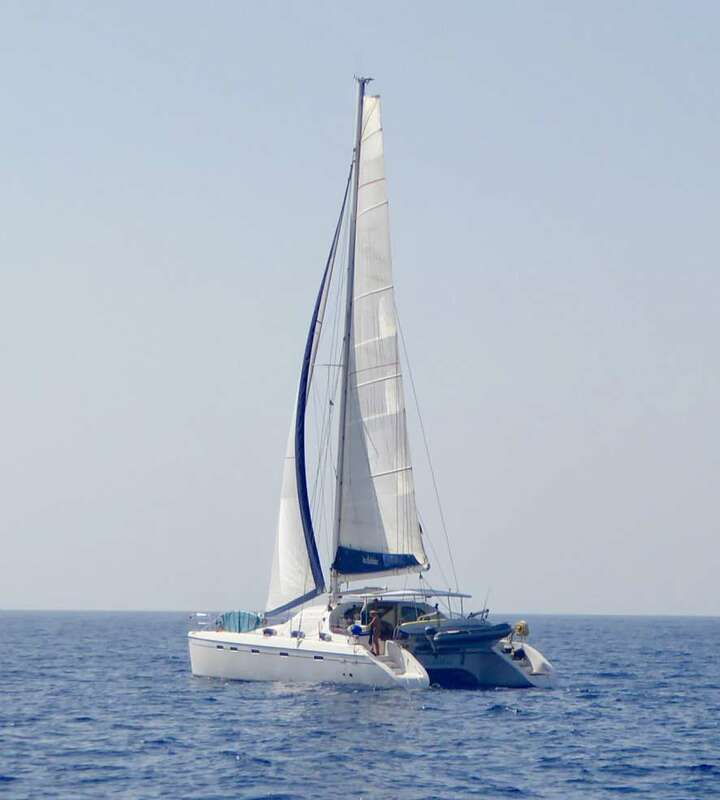 Rates are all inclusive (meals, drinks, fuel, mooring and customs charges, use of toys (kayak, paddle, snorkeling equipment, bed linen, towels, final cleaning). Except of course gratuities which are at your discretion. 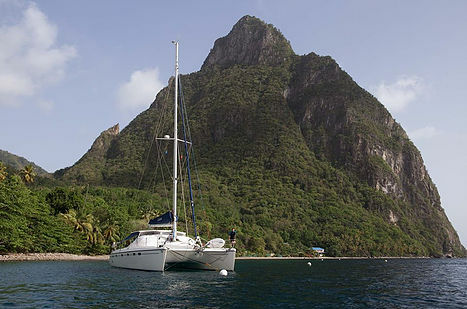 Rates are within in St. Vincent and the Grenadines.